Increased use of air-conditioning, made possible by access to affordable, reliable electricity, goes a long way towards counteracting the acute effects of excessive heat events, a.k.a. heat waves, on human mortality and morbidity. Projections of rapidly rising human heat-related mortality under a warming climate, such as those made in a recent paper published by Joan Ballester and colleagues, fail to acknowledge the power and reality that this and other (even simpler) adaptations can have at protecting human life. When it comes to energy and climate policy, one cannot make an ‘other things equal’ assumption. More climate policy means less energy, period. As an increasing frequency, intensity, and duration of heat waves is anticipated as the climate warms from the combination of a build-up of atmospheric greenhouse gases and growing urban and suburban environments, expanding the availability of affordable, abundant, and dependable energy should be one of our highest high priorities. Instead, there is a deluge of proposals (in part fuelled by results like those of Ballester et al.) aimed at limiting the emissions of greenhouse gases produced from the combustion of fossil fuels—actions which threaten the quality and quantity of our energy supply, and thus run counter to the practices which best allow adaptation to climate and climate changes. From where I sit, our health and welfare is more under threat by regulations, laws, and/or treaties which (would) act to hold one hand behind our back as we try to best protect ourselves from the vagaries of climate (and to a far lesser degree, climate change). And the justifications for doing so ring hollow, as virtually all analyses of the impacts of such proposals show them to be ineffective at producing any meaningful mitigation to projected climate changes—that is, without the bulk of the work being done by developing countries such as China and India. Of course, developing countries realize that the positives from expanding the availability of affordable and reliable electricity, including the adaptive power that they afford us, outweigh the negatives from climate changes that any resultant greenhouse gas emissions may produce. Therefore, electricity from fossil fuels continues to lead the way into the future. For some reason, a lot of people seem to doubt, or at least greatly underestimate, the innate desire of humans not to want to die. How else can you explain future projections of heat-related mortality that predict an ever-rising number of deaths as the temperature increases? Especially in light of the fact that observations from the real world clearly show that the more frequent extreme heat becomes, the fewer people die from it? But real world observations of adaptation seem to have done little stem the tide of projections of increasing heat-related mortality. The U.S. EPA incorporates them into the justification for their endangerment finding, and a new paper making the rounds is making dire projections for Europe. The steps necessary to avoid dying from the heat are fairly straight forward—seek out air conditioning (having access to reliable cheap energy helps out a lot here), drink plenty of water, wear appropriate clothing, limit outdoor activity. This really isn’t rocket science. The only way to predict more deaths from more heat is for researchers to dig their heels in and doggedly assume that the way people react to high temperatures now is the way that they will forever, and thus they will die in record numbers as high temperatures occur more often. I guess this is the “dumb people scenario” which is akin to the “dumb farmer scenario” that similarly leads to projections that we’re all going to die from lack of food as the climate changes and farmers don’t adjust their crops, planting methods, etc. And if the philosophical argument doesn’t sway you, here is some actual data on the evolving relationship between extremely high temperatures and human mortality. Research study after research study reveals two strong patterns—one spatial and the other temporal—of heat-related mortality across the United States. The first is that the hottest places in the country are the places with the least amount of heat-related mortality. The second pattern is that over time (even as temperatures rise), the rate of heat-related mortality declines. In fact, the declines are the greatest in the years immediately following major heat-waves in which a lot of people die. These patterns are strong indication that people not only adapt to high temperature extremes, but that such adaptation can occur in a very short amount of time. 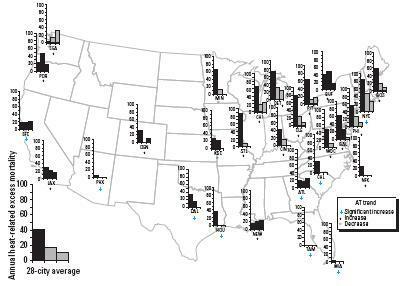 Figure 1 (taken from a paper I was a co-author on) nicely illustrates these two patterns in the U.S. Notice that 1) the places with the hottest summer climate have the lowest rate of heat-related mortality—places such as Phoenix, Dallas, Houston, New Orleans, Tampa, Miami; and 2) that over time, the rate of heat-related mortality (in a standardized population) has declined across nearly all of the cities that we studied—despite rising summer temperature. That a decline in heat wave sensitivity can occur rapidly following a wake-up call type of event (i.e., a major heat wave that kills a lot of people because they were not adequately prepared for it) is evidenced from the greatly depressed mortality response during the next big heat wave to hit the same location. This has been documented to have taken place in Chicago after the 1995 heat wave (Palecki et al., 2001) and in France after the 2003 heat wave (Fouillet et al., 2008). So, with these two pieces of information in hand—hotter places have lower mortality rates and mortality rates are declining over time (even as temperatures rise)—how would you go about forecasting the evolution of the patterns of heat-related mortality in the future assuming a warming climate? Well, I would think that as the temperature climbs, humans will increasingly try to avoid dying from it. The more commonplace heat waves become, the better we will become at dealing with them (as current patterns indicate). Certainly, there would be a few surprises in places not used to experiencing extremely high temperatures—like Chicago in 1995 and Europe in 2003—which will sharply elevate the numbers of heat-related mortality during those particular individual events, but I imagine that folks will pretty quickly learn what not to do and will be much better prepared when the next heat wave comes around. Over the long run, then, I would project that hotter summers will lead to lower rates of heat-related mortality (in a standard population—that is, not taking into account changes in population demographics such as age structure—which are not climate-related changes). Had Seth interviewed me, he would have gotten a completely different take. Tomorrow, I’ll tell you why. Ballester, J., J-M Robine, F. Herrmann, and X. Rodo, 2011. Long-term projections and acclimatization scenarios of temperature-related mortality in Europe, Nature Communications, doi:10.1038/ncomms1360. Davis, R. E., P. C. Knappenberger, P. J. Michaels, W. M. Novicoff, 2003. Changing heat-related mortality in the United States. Environmental Health Perspectives, 111, 1712-1718. Fouillet, A., G. Rey, V. Wagner, K. Laadi, P. Empereur-Bissonet, A Le Tetre, P. Frayssinet, P. Bessemoulin, F. Laurent, P. De Crouy-Chanel, E. Jougla, and D. Hémon, 2008. Has the impact of heat waves on mortality changed in France since the European heat wave of summer 2003? A study of the 2006 heat wave. International Journal of Epidmiology, doi:10.1093/ije/dym253. Palecki, M.A., S.A. Changnon, and K.E. Kunkel, 2001. 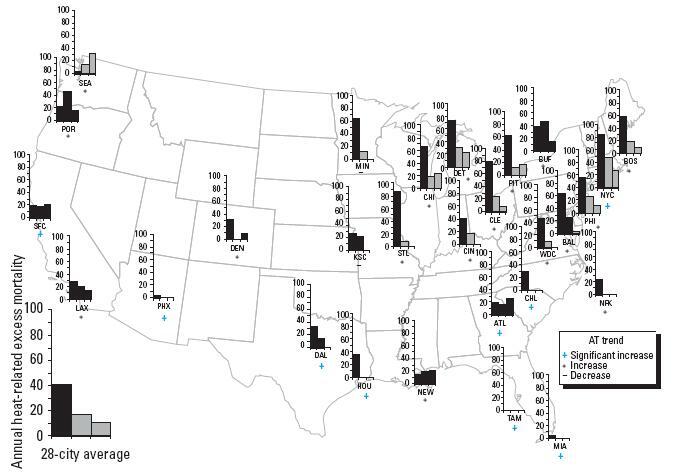 The nature and impacts of the July 1999 heat wave in the midwestern United States: Learning from the lessons of 1995. Bulletin of the American Meteorological Society, 82, 1353–1367. Well argued, as usual, Chip. What you describe in your critique of the Ballester, et al paper, is merely the latest example of science done wrong, of methodology mired in prejudice, with evidently no attempt to mitigate or control for bias, and without properly accounting for all the relevant variables, both individually and in combination, that could produce a result. The utter complexity of the issue, along with the many direct and inversely operating dynamics, some of which you describe, make credible predictions highly suspect. Perhaps you should market Climate Tarot in response. I’d bet heat related mortality across the US had to be quite high in the thirties and forties, sadly before the records in your studies begin, when people were both less wealthy and adaptive, and high temperature extremes in the US were even bigger than anything in recent years. One of the things that advocates refuse to even deal with is the fact that our adaptive capacity is reduced substantially by emissions restrictions, while having little impact on the climate and therefore in net increasing the damages from change. Of course, in the real world, the damages from AGW are zero or very near zero (certainly not measurable) and there are even net benefits in many cases, so they diminish damages from near zero to slightly nearer zero, with a significant price tag far exceeding the supposed, unmeasurable benefit. This is basic common sense, we should drop this ridiculous approach to “addressing” the “issue” of AGW and focus on growing our economy to be better off in the future whatever it may hold in store.